Back in October, a friend and I started a project targeting Maemo. We had been thinking about programming for maemo for a lot of time (but for Diablo devices), and Fremantle's new UI, so appealing, almost got us buying a N900 (we ended up buying a HTC Tattoo, but that's another story). At that moment, I was going to the cinema maybe twice a month, and as some of my friends have the (sometimes annoying) habit of waiting after the credits to see if the movie has extra scenes or something, I thought it would be nice if I had an app in my phone which could tell me if it was worth waiting. 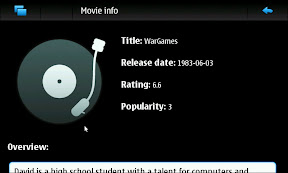 A nice brainstorm started, and we added showtimes and other movie info to the app, so Maevies -from movies + maemo- was born. After that, it was "just" a matter of researching which web services could provide that info. We got the backend "working" rather soon. We started using librest and synchronous calls, so the user would be blocked until we got a response from the web services. We wanted to have a basic backend functionality, and quickly focus on the UI but... we stopped there. We met a couple of times to get started with the UI, but didn't get too far. About a month ago I announced that we were starting the development module in the master and that, after having enjoyed an introduction to python, I was quite convinced to port Maevies to Python. Then, I commented in the same post that I wouldn't port it, but mimic the architecture we're using for the master app: C with GObject for the model, and Python at the view, connected using DBus. Soon I had all the old maevies backend adapted to use GObject, all the librest references removed and replaced with libsoup's, and a basic prototype with PyMaemo, with a fake behaviour like the one I would expect from the actual app. Today, I can announce a "functional" pre-alpha version of Maevies. I've created a page for it at this blog, and linked it from the maemo garage's one, have taken some screenshots, and pushed the last commits (yeah, I also migrated from subversion to git, now that I'm feeling really comfortable with it). So what's going on with maevies? About the backend: A movie can be searched in themoviedb.org -getting its basic info- and whatsafterthecredits.com -getting the information about extra scenes. There is also a module which parses Google Movies html, not using GObject yet, but some changes in their API seem to have broken its support. Not all the TMDb retrieved data is exported via DBus, nor displayed later on the UI, so that would be a point. It would be nice to display the movie images, also.